Need a dessert and not much time for baking? When I am asked to bring a dessert or have friends coming to my house, I can count on this recipe for its ease in preparation and its popularity when served. This is one of the most popular posts on my blog and for good reason. 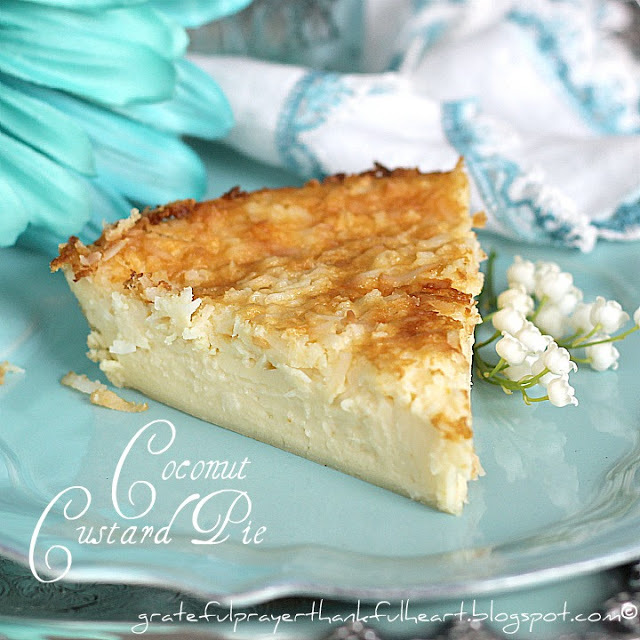 Impossible Coconut Custard Pie is a breeze to make and it is so delicious. 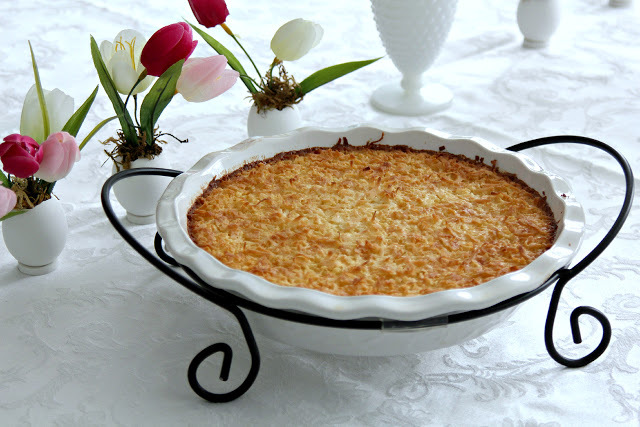 Unable to find my recipe for Amazing Coconut Pie (the kind that uses Bisquick to make its own crust), I went searching through my cookbooks and found a similar one. Well, I need not search any further because this new version is so much better! 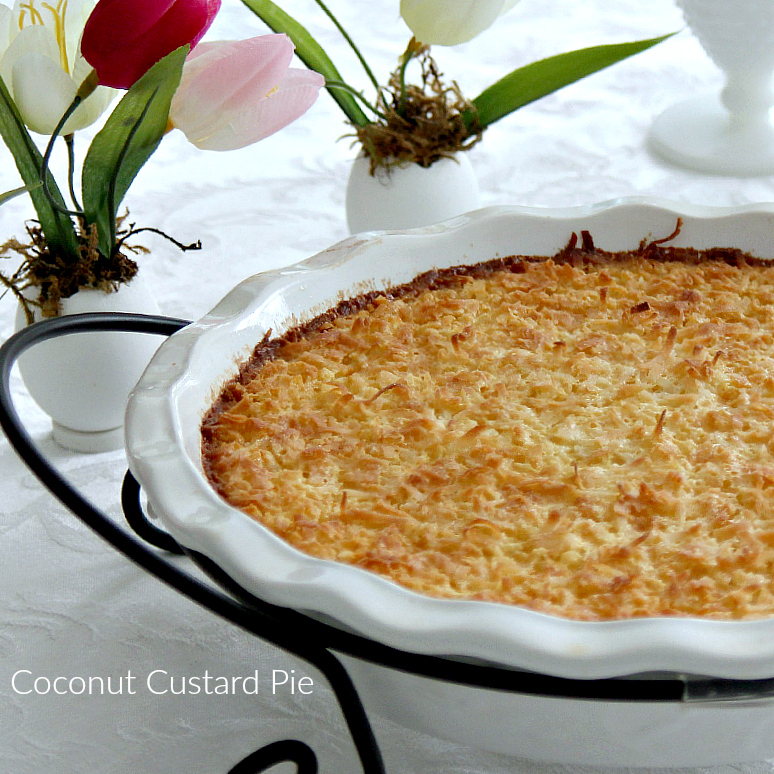 Impossible Coconut Custard Pie is incredibly creamy, delicious and not ‘egg-y’. Put the lid on the blender and blend on high for three minutes. Yup, it’s going to be noisy ;). 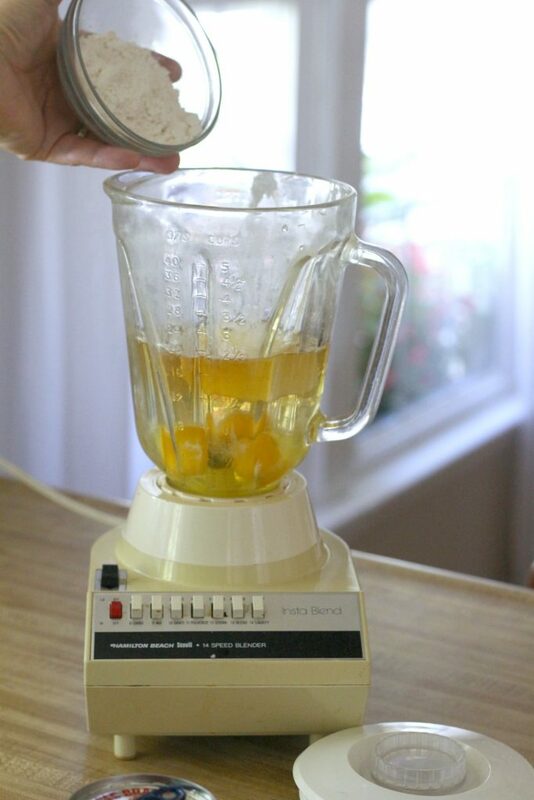 This blender is probably older than most of you reading this post. Probably from the late 70’s when we were just married! It has made a lot of coconut custard pies! 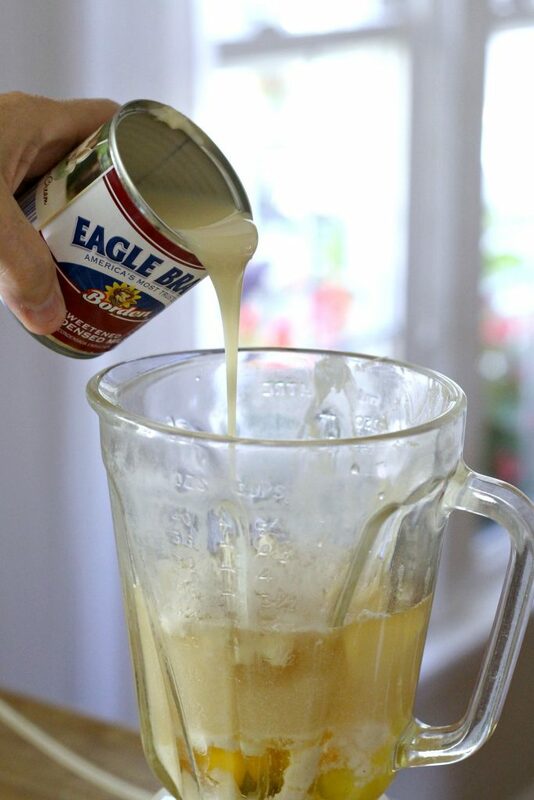 Pour the mixture into a lightly greased pie pan. Allow the pan to rest for five minutes. 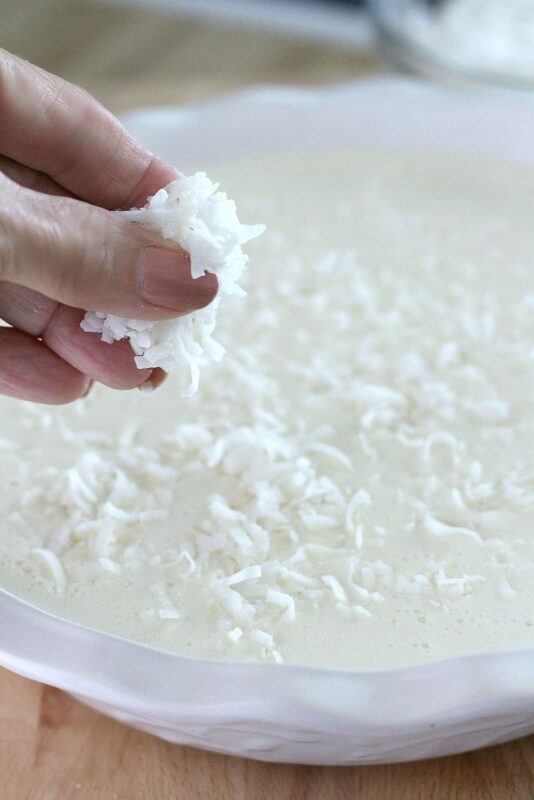 After five minutes, sprinkle coconut evenly on top. Here it is all ready for the oven. The recipe uses Bisquick baking mix that magically forms the crust but the ingredient that totally takes the taste over the top is the sweetened condensed milk. I think it is what makes the pie so velvety smooth. That, with the toasted coconut topping and you have a yummy dessert. It is perfect for any time of the year but especially lovely served for an Easter breakfast or brunch. I make it frequently. Because the ingredients are staples in my pantry, I turn to the recipe when I need to make a dessert last minute. In blender container, combine all ingredients except coconut. Blend on high speed 3 minutes. 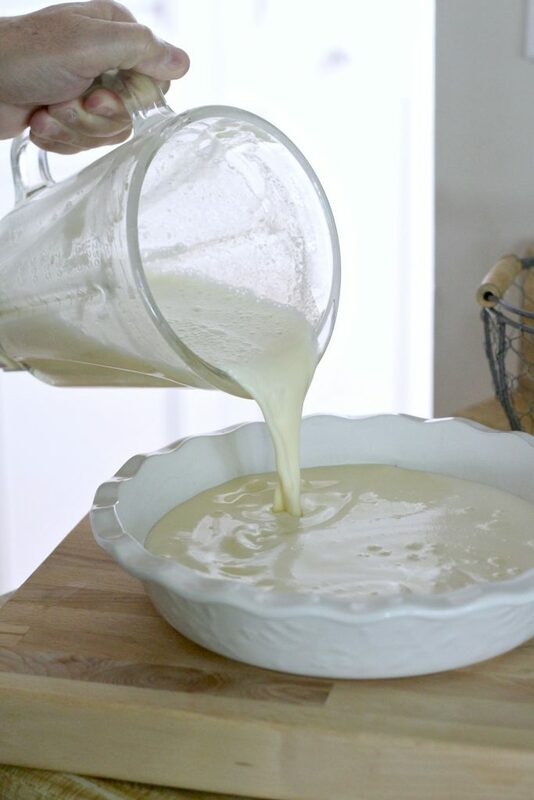 Pour into greased 10-inch pie plate; let stand 5 minutes. Carefully place in oven; bake 35 to 40 minutes or until knife inserted near edge comes out clean. Cool slightly; serve warm or cooled. Refrigerate leftovers. Some readers do not have Bisquick Baking Mix available where they live. I have not tried it myself, but searched and found a baking mix substitute that I am sharing if you want to give it a try. Please drop me a note or send a comment if you try it and how it worked out. Mix dry ingredients together in a small bowl. Cut in shortening using a pastry blender. If you enjoyed this post, you’ll love my weekly emails. Subscribe to have updates delivered to your inbox and receive Freebies available exclusively for subscribers! 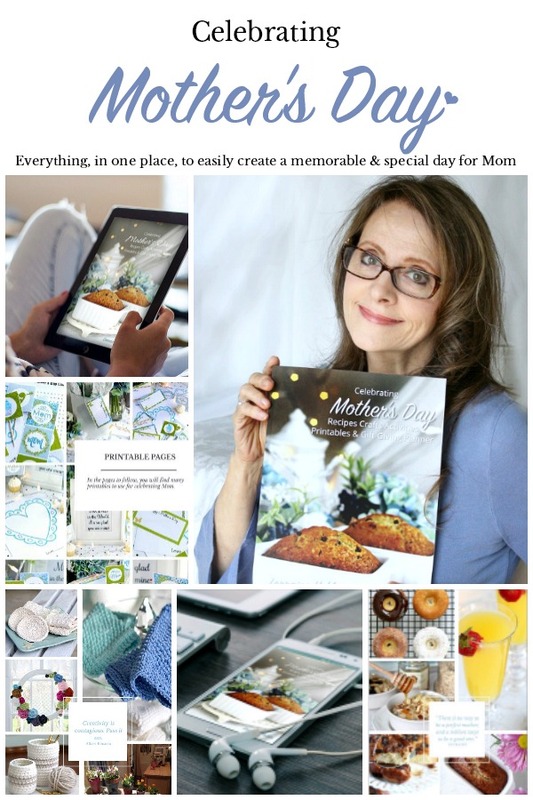 Don’t miss new recipes and ideas to inspire and encourage you. Join our community by clicking the subscribe button below. I made this today and it is unbelievably good! I did exactly as you instructed and used your Bisquik substitute. I doubled the recipe because I had 11 ladies to serve, made it in a 9 x 11 pan, baked it 40 minutes. It was perfect! Thin crust on the bottom, creamy middle layer, crunchy golden top. A couple of days ago I tried another recipe by this name, but with lemon. The pie itself came nowhere near yours, and I personally thought the lemon didn’t work well with the coconut. It was like the flavors were competing. Thank you so much for sharing this wonderful recipe. So happy to hear that you like this pie recipe and I love that you shared how you doubled it. I will surely try that too. Thank you for taking the time to visit and leave your comment. I see the coconut is only placed on top, does that mean there will not be coconut with in the center of the pie? If not, can you mix half the coconut in and place the other half on top? 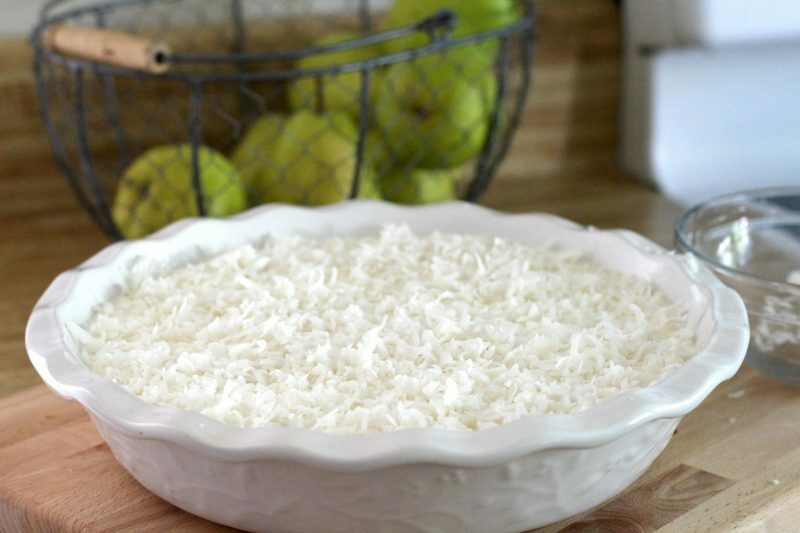 The coconut is only sprinkled on the top but since the pie is thin, the coconut flavor fills each bite. I don’t think it would make much of a difference in flavor if the coconut was divided for both the top and center. And, the coconut on top browns nicely during baking. One other thought… since the baking mix needs a few minutes to settle before baking to form the crust-like bottom, the coconut in the liquid might interfere. Probably not but just wondering. Hope this is helpful for you and thank you for stopping by and leaving your comment! Just wanted to let you know, my Mom still has that blender. I remember it growing up. The pie looks fabulous. Can’t wait to try it. 🙂 Yes, those old appliances sure do seem to outlast the newer ones. 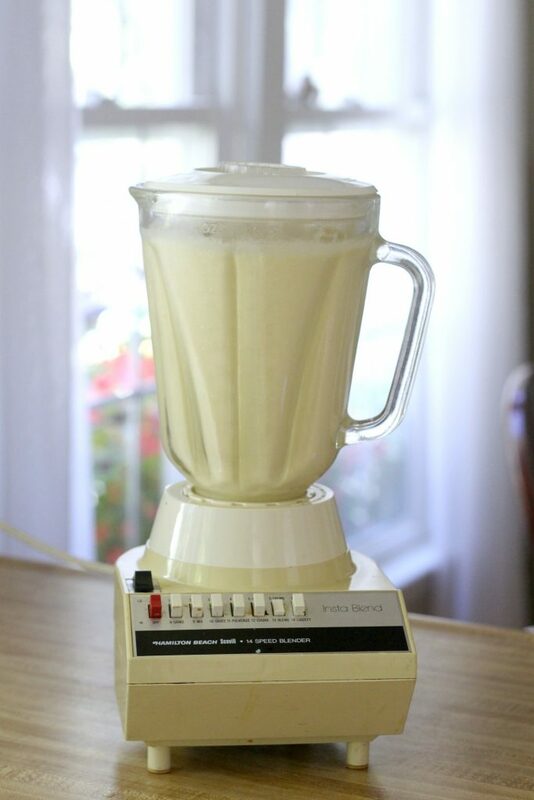 This blender has been around a while, making lots of stuff including the coconut custard pie. I’m not sure how it would work out adding the liquid to a pie crust since it makes its own crust. This recipe does not make a typical pastry crust but rather one that allows the pie to be cut into nice slices. The purpose of this recipe is to avoid the work of making a crust. You could experiment but excluding the Bisquick baking mix and see what happens. If you do, please let me know how it turns out. Ever tried it with milk instead of water? No, I have only made the recipe as written. It tastes pretty rich and creamy with the water so I am not sure what difference it would make to substitute milk. Let me know if you try it and how it works out. I used gluten free Bisquick to make it celiac friendly. Hi Tina, Thank you for your comment. I hope this is helpful for other readers with the same dietary need. I use PAM and a quick spray. I have never had a problem with the pie sticking or slicing it. I tried this with COCONUT condensed milk and GLUTEN FREE Bisquick. DELICOUS! It worked equally well, just required a few extra minutes of baking which you can tell when the middle isn’t so firm. We nixed the shredded coconut because there is enough coconut flavor in the milk and we aren’t fans of the shredded coconut texture. Loved this recipe. Keeping it! Like this idea. We don’t like the coconut texture either. Thanks. Can this be made a day ahead and served chilled ? I have enjoyed leftover pie, so though I think the pie is best the day it is made, you can make it a day ahead and store in the fridge for the following day. LOOKS YUMMY!! Does it need to be baked in a pie dish? What else would work? Made this pie 4 times in 2 weeks. Just wonderful. The first two coconut custard pie were too sweet for me. Making the third and forth pie I bought unsweetened organic coconut flakes and mixed with sugar water to sweeten to my taste. It came out excellent. Remember there is enough sweetness in the sweeten condense milk to begin with. I now a new dessert to offer friends & family. Thanks for the recipe. Could I use a 9” pie pan that is all I have. It looks like there is a little space in your 10” but I don’t want a big mess in my oven. I think using a 9-inch pie pan will work just fine. Through the years I have used various pans and never had a problem. The pie doesn’t rise so it shouldn’t be a concern. Just found this recipe, and I cannot wait to try it out! My mother likes Coconuts and so do I. I want to make a few pies to take the Church Dinner on Wednesday Night. Can I use coconut condensed milk instead of regular condensed milk? I am not familiar with the product, coconut condensed milk but it sounds delicious. It would intensify the coconut flavor for sure. I’d love to hear back if you give it a try! Yes meaning sweetened coconut condensed milk. This is in the oven as I type. I’ve had this pie before and ran across your recipe to make it. I did sub the baking mix for flour, baking powder and salt. Because I get comments that some people are unable to find Bisqiuck where they live, I have updated the post to include a substitution. Thanks for the suggestion! Since the bisquick substitute makes 1 cup, does it follow that you add the entire cup or still just 1/3 cup? Use the substitute in the same quantities as you would Bisquick. In this recipe, use 1/3 cup. I made this for overnight guests a few weeks ago. We all loved it! I’m making it today to bring to church dinner. The last time I made it I set the blender on low speed according to the printed directions & it was wonderful. This time I’m going to try it on high speed as it says in your directions. I am happy to hear that you and your guests enjoyed this dessert. Thanks a bunch for stopping by and leaving your comment! Can I use a mixer instead of a blender? How long should I mix it? I had another reader tell me she used a mixer instead of a blender and it worked for her. I would guess mix it for 3 minutes as you would if using a blender. If you have whisk attachment for your mixer, I would use that. I have a rotary hand-held whisk I love and think it might also work. Let me know if you try it. Thanks for stopping by! Thanks for quick answer about coconut. Krusteaz makes a pancake waffle mix. Ive never bought bisquick. So not sure if they are similar. Can you use Krusteaz? Is coconut sweetened or unsweetened? 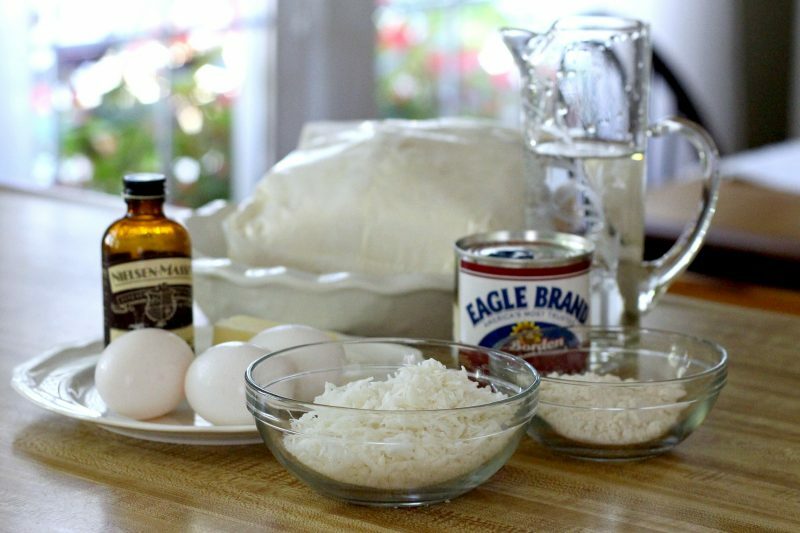 The recipe for Impossible Coconut Pie uses sweetened coconut. I have only used Krusteaz muffin mixes and am not really familiar with their other products. If they make a product similar to Bisquick, I don’t see any problem making a substitution. I will make this over and over. I used a little more coconut than it called for but it was just perfect. Really Yummy. Great pie. I mix it with a mixer.Second time fixed in two weeks! Today is my 2nd time making this pie in two weeks (holiday season).It was such a hit at a party i took it to, I am making for my family xmas eve get together for tomorrow. VERY easy to make and not that many ingredients that i didnt already have. Makes its own crust. I recommend it! Has anyone tried this with gluten free Bisquick? I've just come upon this recipe and it looks so good. Would I be able to use a cake mixer instead of a blender? Or is a blender necessary? 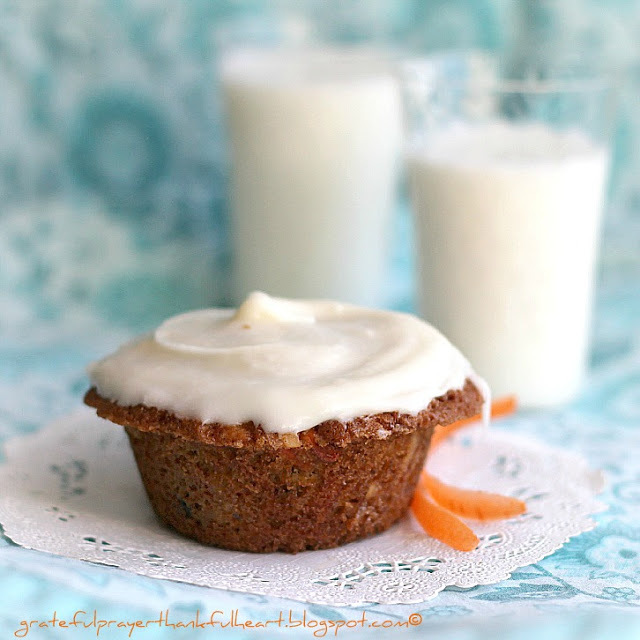 I made this a few times, I Love it…..Everyone wanted the recipe! So I tried it without coconut last night to make a plain custard pie. I added an egg to make a total of 4. It was very firm, so I think it could have even done without the addition. My husband LOVED it. I prefer it with coconut but he is coo coo for custard. It was awesome! We will be using this recipe a lot! I Didn't have Bisquick so I used 1/3 cup flour, 1/2 tsp baking powder, and a pinch of salt. Turned out soo yummy! I wonder, could you omit the coconut to make a plain custard pie? Should I increase any ingredients to make up for the volume of coconut? My husband LOVES custard. This was SO GOOD! My very favorite pie! Thanks! I'm on round 2 and this time forced to make TWO because one is just silly!! Lol wonderful and loved by all, this pie doesn't last in my house!! I decorated with small pineapple, cream cheese and confectionary sugar truffles, rolled in coconut this time, so let's see how they like that??? Thanks for this wonderful recipe!! I made this last night and today I am forced to make another one because the whole pie went in a flash. It was delicious. It takes no time to make. In fact my oven wasn't even pre heated by the time I made the batter. Yep, that quick. I posted the picture of my finished pie and I got so many requests for a slice, lol.. Thanks for the great recipe. Love it and I will be making this a lot I'm sure because it's my husbands favorite pie. I loved the idea of this dessert because it's preparation is so low key. Unfortunately, I'm unimpressed by the end product. The flavor is nice: sweet and eggy; reminiscent of flan or tapioca though an entirely different texture. It is a nice dessert, but it doesn't inspire me to reach for a second slice. In the pros column, its preparation results in less mess than a box of brownies. What a beautiful picture! I will have to try this one because something that beautiful has to taste delicious, too! I used to have a similar recipe and lost it. So glad to find this ~ looks and sounds delish! I've never heard of this recipe, but wow, it looks amazing! Might have to make it for a picnic this weekend ;). Fabulous photo – Happy FF. 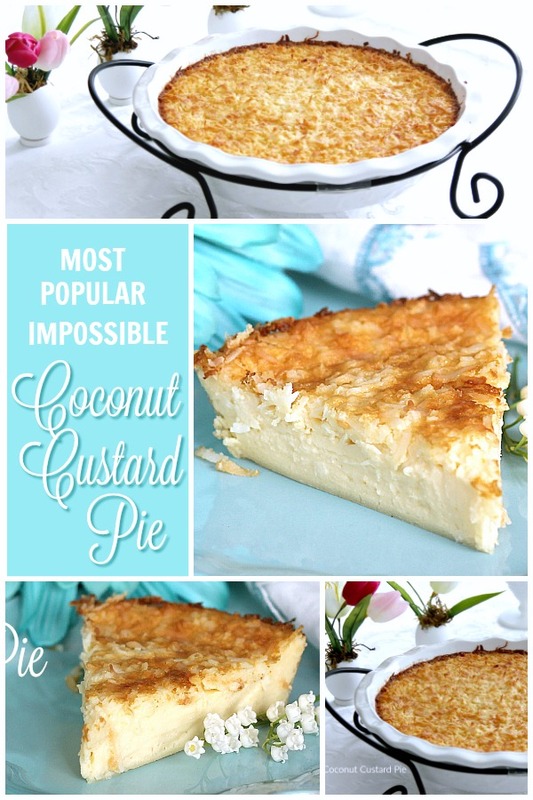 I've never tried the impossible, but since coconut pie is my very favorite, your recipe is definitely worth a try. What a beautiful photo! 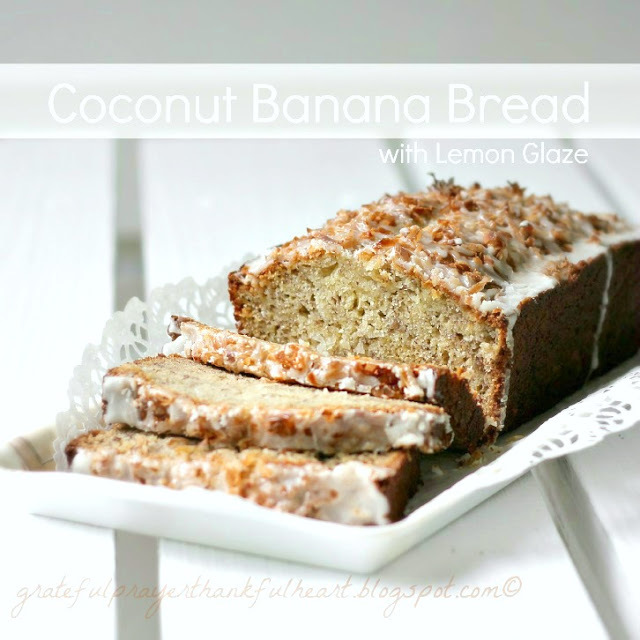 Coconut is one of my weaknesses, so I can't wait to try this recipe. Hi again….it's Thursday, and I'm trying to catch up on yesterday's comments left for me. I just wanted to say thank you in a big way for your sweet anniversary comment and your happy wishes. I also made a small token graphic for my appreciation…on the top portion of my blog entry for the day!! Mmmmm…..that looks great and easy to make. I'll have to give this one a try. OMG! I just love anything with coconut nd this is no exception! Thank you so much for this recipe, I will make it soon and let you know how it came out. My hubby loves "pies" specially and I make good pies myself, but non with coconut, so thank you! I had been a follower of your nice blog, for which I'm so glad as I like it very much. 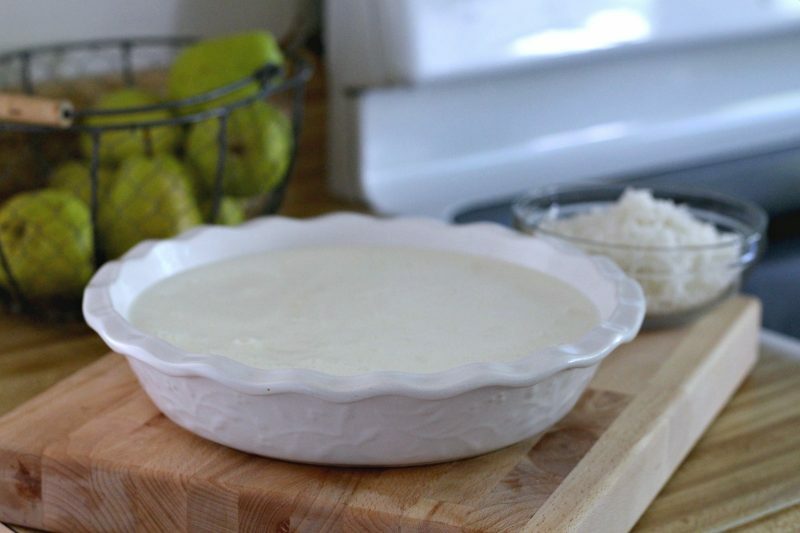 I haven't seen this version with the sweetened condensed milk…what a wonderful pie!! This one looks like another keeper. haha what a name! the texture looks so creamy that i just want to have a big slice!! would've never thought it has biscuit mix in it too! Refrigerate leftovers? Ha! This looks delicious and I don't think there will be much left over. This is a crust I could make! I am so crust challenged! I am not a huge coconut fan but this looks amazingly good. The lilies of the valley are so pretty. My favorite Spring flower, reminds me of my grandmother! This looks so good. Larry has a birthday coming up and coconut is his fav! It looks delicious, L! Love the lily of the valley too! I still have that little pamphlet with all the impossible pie recipes from so long ago! Years ago our girls would make an 'impossible' coconut pie a couple of times a week, as I remember fondly. How they loved to bake! And what a great recipe that was, I'm sure I must have it written down somewhere here. I try not to bake much these days, but its oh so tempting. Your new recipe looks luscious. Being lactose intolerant saves me a few caloriew anyway! But I used to love all the baking we did too. I love all of these creamy pies too. But I unfortunately I too am lactose intolerant. WEll, I thought I'd sent the comment but I'll give it another try…it disapperared into Cyber Space! What I said was I made a recipe like this when I was in high shcool and I loved it; didn't remember it until I saaw yours…YUM! It's not chocolate, but this looks like something I would love to try! It certainly looks delicious! I'm so glad you couldn't find your old standby recipe! Thanks for sharing this one! Looks fantastic! It made it's own crust? So even a baking-challenged person can do well with this one? I have to try this. I had to laugh when I read the title of this post! Any pie is "impossible' for me! But your pie looks awesome! That photo is perfect…it ought to be in a beautiful cookbook! Do you have a substitute for bisquick? ?